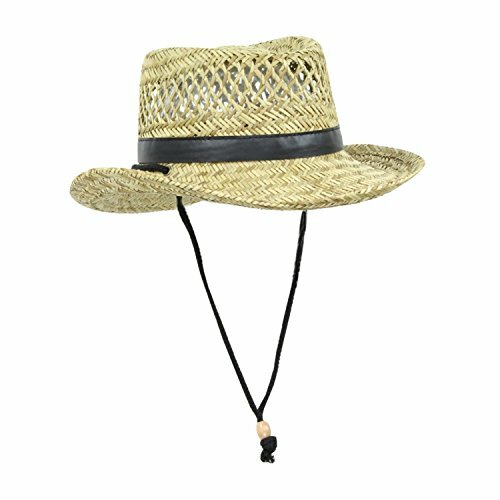 Fun In the Sun natural straw gambler sun hat for men. Straw sun hats protect from the sun, while allowing heat to escape and air to flow, keeping you cooler on hot days. 3.5 inch wide brim provides ample protection for your ears, nose, face and neck. This handsome Gents' sun hat features the classic Gambler style flat top crown and sports a band of vegan leather at the base of the crown in a contrasting color as well as the adjustable chin strap for those windy days. There is an elastic interior sweatband that allows the hat to fit up to 24 in and includes free hat size reducing tape. Insert tape behind sweatband to reduce size if fit is too loose. If you ever need replacement strips of hat sizing tape, feel free to contact Fashion's Little Helpers via Amazon.com and we will be happy to send you a replacement set of tape for free. Available for a limited time only.